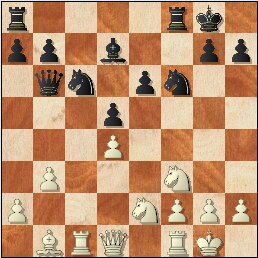 1.e4 e6 Early in the week, I toyed /\ playing a Sicilian or Modern, to avoid my opponent's usual, drawish Exchange Variation, but decided against them, because the event is rated. 2.d4 d5 3.Nd2! A pleasant surprise, even if it is White's best. Now we'll have unbalanced P structure, instead of symmetry. 13.Bf4 Ah. Now I see what 12.b3 was about. White wanted to trade d.s. Bs without sacking his b2 P.
16.Rc1 Bd7 Time check : Mangion has used approximately 14.5 minutes versus my 18.5. 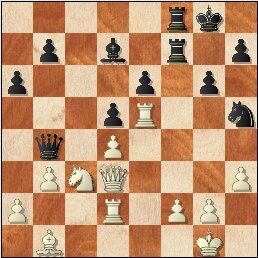 18.Nc3 Qb4 While looking to make her way to d6 or e7, the Q stops White from gaining space with a3+b4. 19.Re1 a6? This seriously weakens b6 &, along with it, c5. [19...Re7+/= was right.] Luckily for me, however, White ignores this fact & takes aim at my solid K-side. 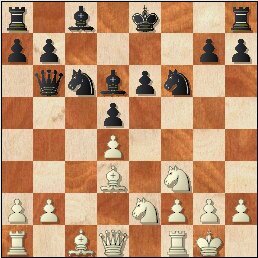 20...Re7 This takes the sting out of a possible Na4-c5, as the B could go to e8, instead of c8, & the R would be guarding b7. 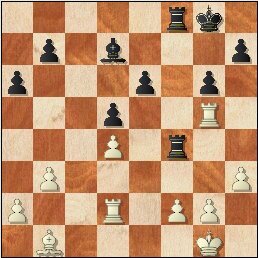 23...Nxe5 24.Rxe5 Ref7 Black's position looks like a picture now. He just has to make sure White doesn't have Rxh5. 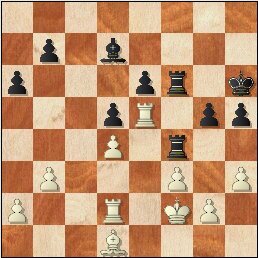 27...Qxg5 Black offers a draw..
28.Rxg5 ... & White immediately declines. 32.f3 >= Rg4, here or next,. 32...Kg7 >= ...Rf8 =, on this turn or the following. 37.Rxe4 dxe4 38.Ke3+- Game over.